So many students make Campbell their home away from home; however, students still miss where they come from and their families. 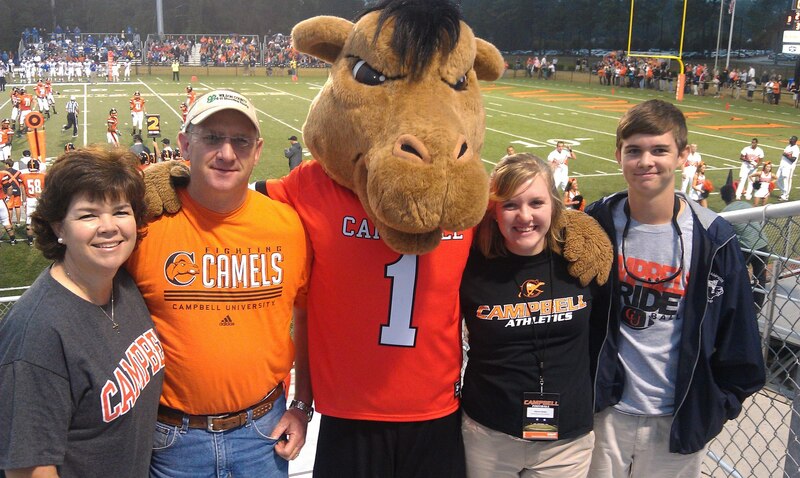 This weekend, many Campbell students had the pleasure of having a little piece of home come to big ole’ Buies Creek– their families! Family weekend is a great chance for students’ family to come and see what students are doing around campus. They finally get to see what actually happens in “camel country”. Families also get to take take part in some awesome activities put on across campus. Allyson Brake, gives an insider’s look to Family weekend as a student and a work study student in the Athletic Marketing & Promotions Department. The highlight of the weekend for many families was attendance at the volleyball and football games on Saturday. Being a student worker for the Athletic Marketing & Promotions Department, I was able to see first hand how many families really did enjoy these events, including my own. Volleyball was a lot of fun, especially during the game of “Hit the Spot” which encouraged everyone to come participate and try and win a prize by hitting some awesome Campbell gear with a volleyball serve. The football game saw one of the biggest home crowds of the year, including my own parents and brother; that is until the rain came! Even though the score was not in Campbell’s favor, and the lightening delay caused many people to change their plans, it was an amazing chance to be able to reconnect with our families who did so much to help us get to Campbell!